The days of Arkansas fans counting up victories before they are won are over. Part of that is the transitory state the Razorback program finds itself in during Chad Morris’ first year as head coach. To paraphrase Morris from last December, if the program were in the shape it ought to be in, Arkansas wouldn’t have had to hire him. It’s going to take time for Morris’ system to take root in Fayetteville. There already has been growing pains and there will no doubt be more. You have seen the schedule for the next month, haven’t you? My hope was that the Razorbacks could win six or seven games this season. Unless there is some stunning improvement in the near future, my hopes were set a bit too high. However, another reason programs in the condition of Arkansas’ can’t count wins is that the playing field among the lower half of Football Bowl Subdivision has been leveled to a degree by the hurry-up, spread offenses. In the past, the advantage that programs like Arkansas — even when down — had over schools like Colorado State and this Saturday’s opponent North Texas was along the line of scrimmage and in overall depth. That advantage has been mitigated to a degree by the up-tempo, air-it-out style of play that has become more and more prominent in the college game. You get a talented quarterback, one like North Texas’ Mason Fine, and give him three capable targets, and they can do a lot of damage, particularly to a football team that is not yet playing up to its potential. Fine has the Mean Green riding high with a 2-0 record coming into Saturday’s 3 p.m. game with the Razorbacks at Reynolds Razorback Stadium that will be televised by the SEC Network on its alternate channel. Fine has completed 65 of 90 passes for 862 yards and 7 touchdowns with 1 interception. The third-year starter leads the nation in passing average, throwing for 431 yards a game. Fine has plenty of capable targets with seven receivers with at least four catches, but Rico Sussey Jr. (17 receptions, 237 yards, 3 TDs), Jalen Guyton (12 receptions, 206 yards, 3 TDs), and Jaelon Darden (8 catches 91 yards) are his favorites. Head coach Seth Littrell’s offensive philosophy is to get the ball out of the passer’s hand quickly and to his playmakers, and Fine wastes little time with his throws. He’s diligent with his pre-snap reads and with plenty of experience, he generally knows where he’s throwing before he gets the ball. What Hog fans will see out of Fine in many ways is what Morris wants to see out of his own quarterbacks. Unfortunately, Cole Kelley and Ty Storey aren’t yet (and may never be) as skilled as an operator of Arkansas’ offense as Fine is the Mean Green’s. The right quarterback in the right system has always been a potent combination. Fine truly elevates his team’s play, which makes up for other team deficits. Fine working in Litrell’s offense makes North Texas very, very dangerous to a team like Arkansas that is struggling to find its way, despite the fact the Razorbacks are a more talented squad overall. After the way the Razorbacks blew last week’s game against Colorado State, the doom-and-gloom contingent of Arkansas’ fans base has already chalked this game up as a loss, and they may very well be right. Arkansas’ quarterback play has been frustratingly mediocre so far this season, but there have been weaknesses elsewhere, too. Receivers have blown assignment and made the QB’s efforts that much more difficult. Offensive linemen and backs have also been complicit, too. Last week’s loss can’t be hung on the shoulders of any one position. The Razorbacks’ defense is playing better than the last two seasons even with projected starters Dre Greenlaw and Randy Ramsey sidelined with injuries. They won’t be fighting against the thin air of Fort Collins, Colo., this week, but it appears the Mean Green are a better team than the Rams on paper. With Morris not letting on who will start at quarterback this week, I don’t have a guess. Morris said he hoped that one or the other would take the reins and run with it, but I’m guessing both will play this week. The Razorbacks might need the best of both to pull off a victory. 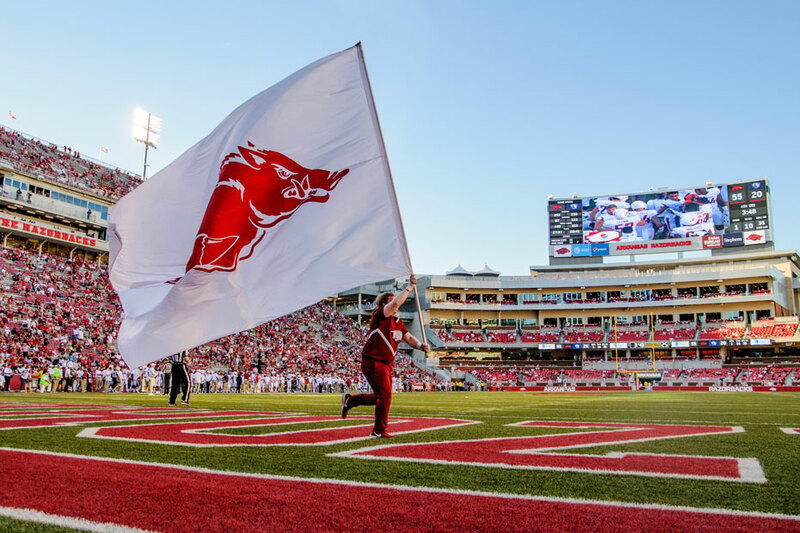 While tempo is Morris’ game, if Arkansas can run the football successfully on the Mean Green, I’d keep feeding it to Devwah Whaley, Rakeem Boyd, Chase Hayden, and T.J. Hammonds. However, that’s my preferred style of football not Morris’. Morris said the Razorbacks would not back away from their philosophy of football, just because of one loss. I like that he is confident in himself, his coaches, his team and his style. Sometimes when things aren’t right, you just have to be stubborn enough to work until you make them so. Morris and the Razorbacks are working to bring respectability back to Arkansas’ program. The job is not going to be easy or quick. While fans are tired of being patient, they are going to have to be. The removal of Jeff Long and Bret Bielema last November meant starting over nearly from scratch. That would have been the case if Arkansas could have landed Gus Malzahn or for that matter Nick Saban. What the Razorbacks and their fans are struggling through at the moment is exactly the reason why Malzahn was only going to leave Auburn if the Tigers wouldn’t have him back. That left an opportunity for Morris, one that he is no doubt trying to make the most of. I like that he believes Arkansas is a sleeping giant. I like that he has a vision for the program that sees the Razorbacks competing for an SEC title. I also know he needs time to make that vision come true. Overall Arkansas is a more talented team than North Texas, but the Mean Green have the advantage where it counts most, at quarterback. That gives North Texas more than a passing chance to earn a victory. I think we’ll learn a lot about the competitive nature of this Razorback team on Saturday one way or the other. I believe the Hogs will play better than last week, but that guarantees them nothing against North Texas.